I love when I get to put together a post that I have thought about doing for a really long time, but for one reason or another, I just haven't gotten it pulled together. Today, I have just such a post. 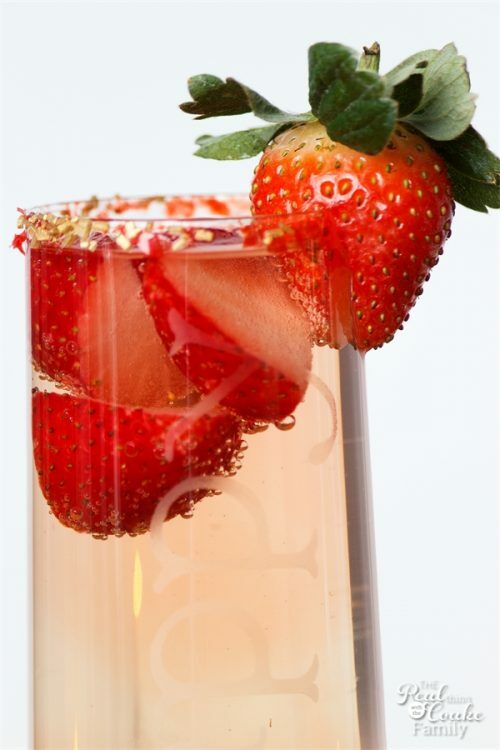 I've got a delicious Pink Delight Cocktail recipe for you. A few years ago, when I made the Pink Delight drink recipe that was for the kids (and therefore, a mocktail not a cocktail), I thought of making the grown up version of that drink. I never got around to it…never even made myself one at home. Boo! Recently, I had the opportunity to work with Gloria Ferrer, who sponsored this post as well as sent me two bottles of wine. I knew exactly what I wanted to make. Let me tell you…the wait did not disappoint. Not only is the drink really pretty, but it is quite tasty as well. Perfect combination! 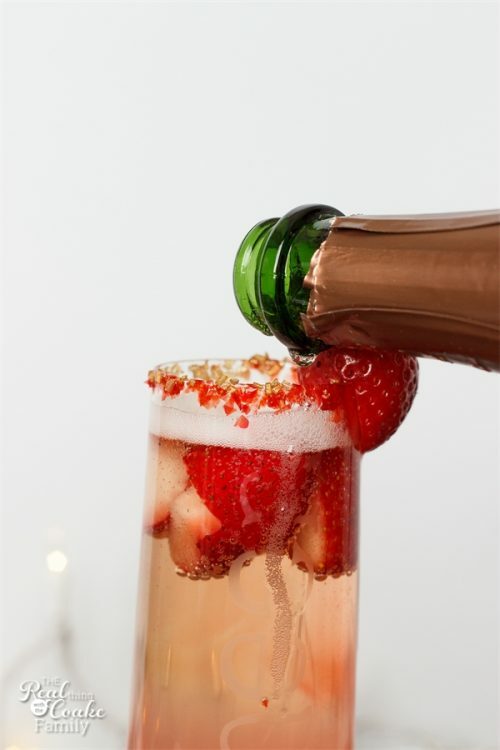 Start by dipping your glass in water or simple syrup. Then dip the glass rim into your sugars or sprinkles. I used water and a few of the sugars ran and got a little messy, but in the end you are filling the glass with a drink and no one will even be able to tell. I have the full recipe with all the specific measurements for you at the bottom of this post. Clean your strawberries and cut them in half. Place them in the bottom of the glass. 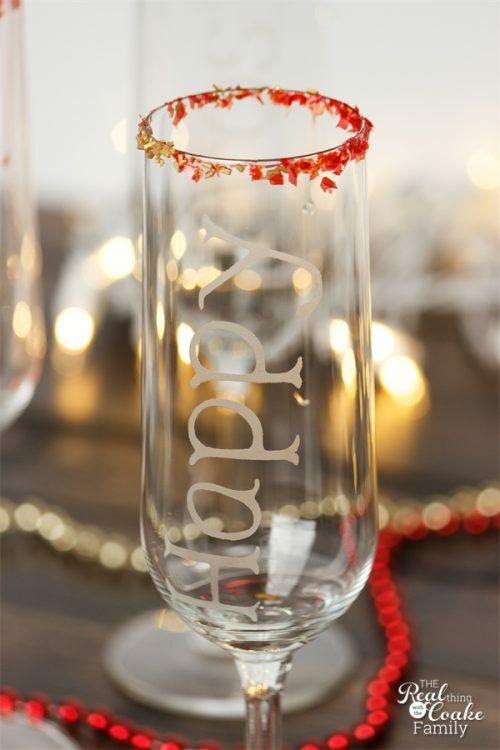 I made these pretty glasses a few years ago for our family New Year's celebration. They are really easy to make. Next up, you will add the pink lemonade. This time, I used an all natural pink raspberry lemonade. 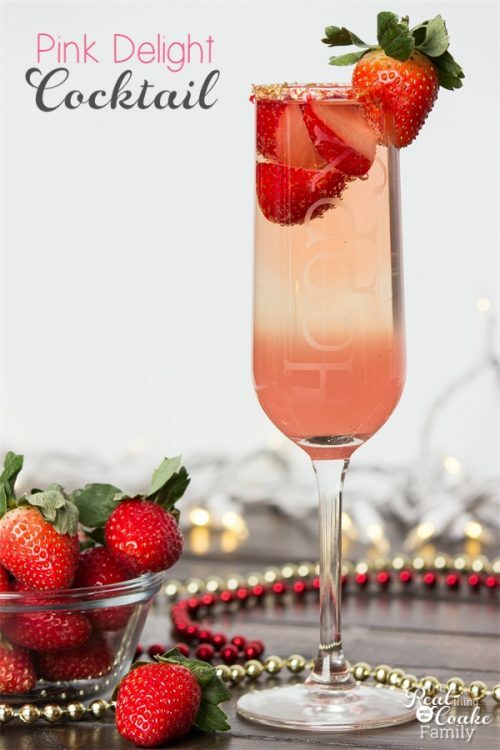 In the past, in the kids mocktails, we have used a straight pink lemonade as well as a strawberry pink lemonade. Anything will work as long as it is pink (and I personally prefer all natural). Now is the fun part! Add the Gloria Ferrer Blanc De Noirs. It is a delicious sparkling wine which is actually 92% Pinot Noir and 8% Chardonnay (which would explain why I like it so much, since Pinot Noir is my favorite wine!). 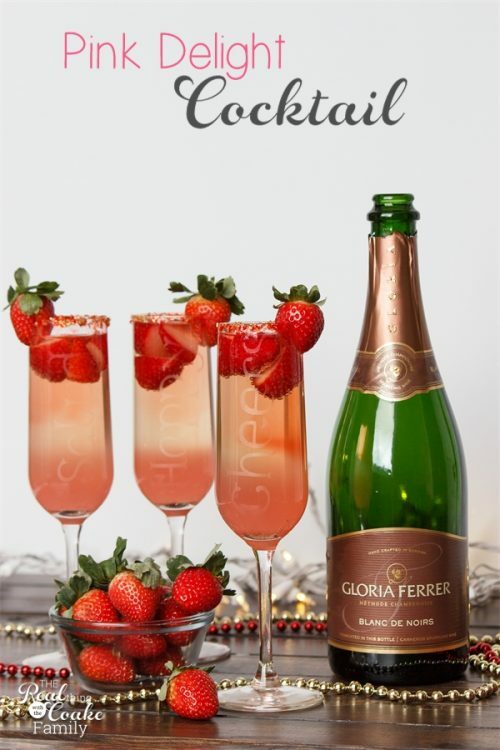 Gloria Ferrer has earned over 400 gold medals and 50 90+ scores all in the last 5 years….like I said, it is a delicious sparkling wine! I love to make pretty things so I love all the pretty bubbles! When you slice up your strawberries, slice one from the bottom leaving the rest intact. Add that as a pretty garnish to your drink. 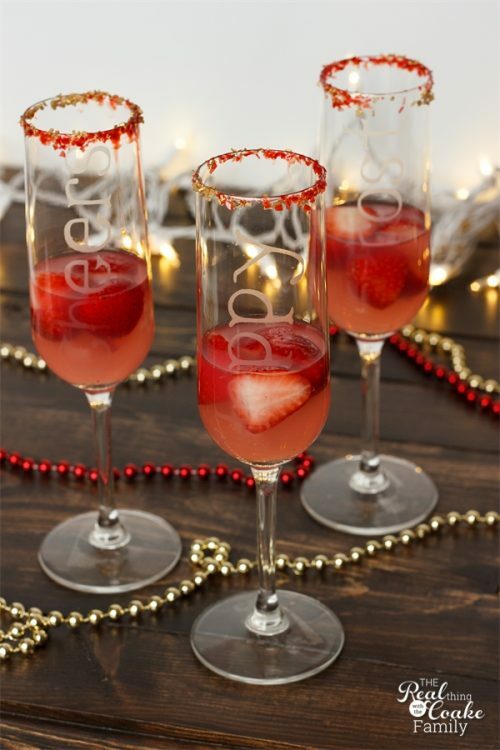 You are now ready to celebrate and enjoy your pretty drink. 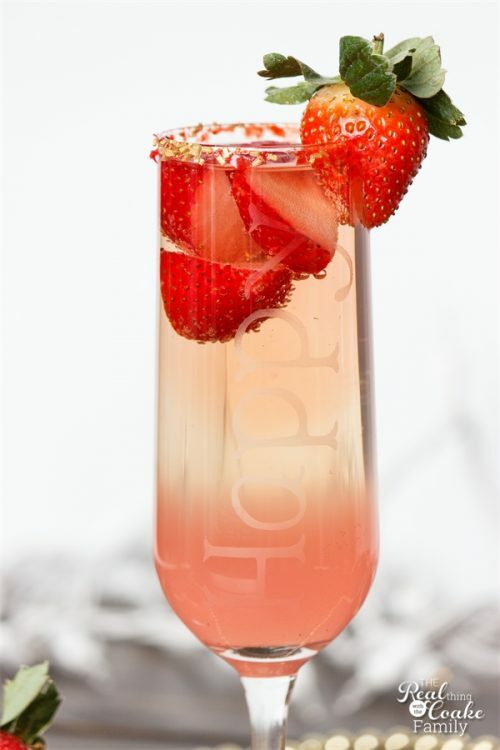 I love how the drink has an ombre effect! If you like, you can add a small scoop of ice cream to your drink to make it even more delightful and almost a dessert and cocktail in one. Mmmm! I think this year we are going to get together with a few families to celebrate the New Year. We are still going to do our New Year's hourly celebrations with my new cute bags, but with other families. I'll be making these drinks for sure. 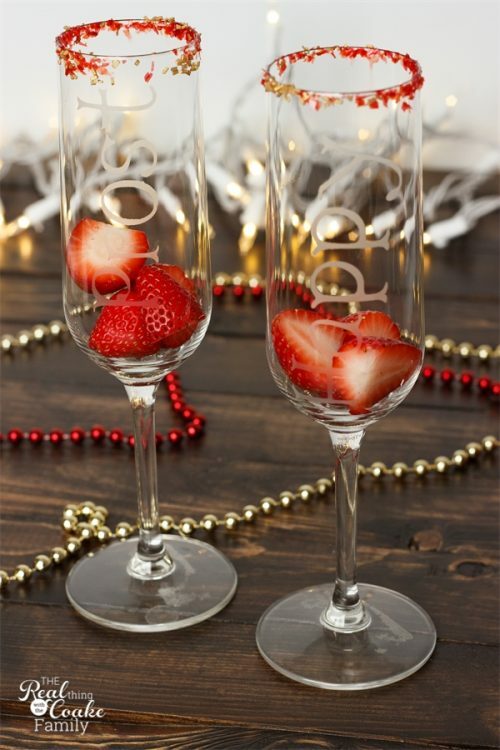 They will be the perfect toast to the New Year! 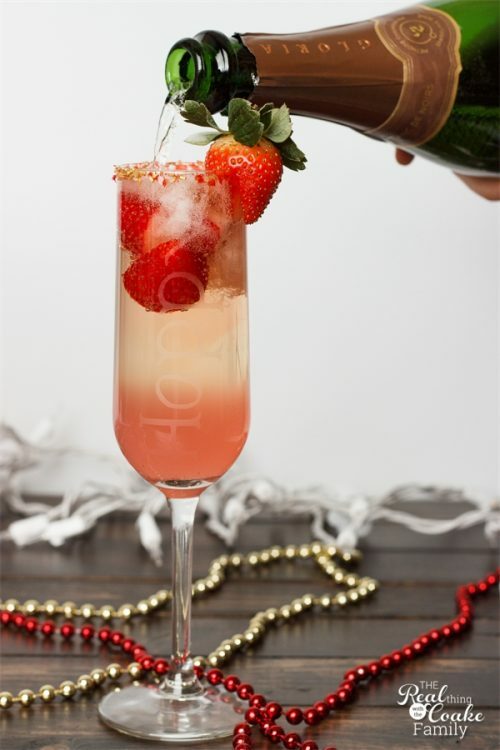 What is your favorite sparkling wine cocktail? Leave me a comment below. Follow me on Instagram and Facebook for even more behind the scenes, fun, and ideas! Those look SO good!! 🙂 Yum, will have to try, love the ombre effect!